Photo credit: Adapted by WhoWhatWhy from North Charleston / Flickr (CC BY-SA 2.0), ouse Repbulicans / YouTube, and JouWatch / Flickr (CC BY-SA 2.0). Back in the 1990s when US financial institutions did not want to loan Donald Trump any more money, Deutsche Bank stepped up to the plate. Since then, the German bank has seemingly played a key role in Trump’s business empire/house of cards. Deutsche Bank has also been involved with all kinds of shady people doing all kinds of shady things. Such as money laundering. In addition, several people in Trump’s orbit — for example, son-in-law and White House senior adviser Jared Kushner — have had their own dealings with Deutsche Bank. Finally, the financial institution also has extensive links to Russia and many of its oligarchs. A reasonable person would say that it’s worth it to untangle these threads that seem to connect many of the key figures in the investigation to Deutsche Bank. Earlier this month, Rep. Adam Schiff (CA), the ranking Democrat on the House Intelligence Committee, seemed to suggest as much. “I think the allegations on money laundering are credible enough that we ought to, in the exercise of due diligence, see if this was one of the other vectors of the Russian active measures campaign,” he said. Congressional Republicans, however, don’t seem to feel that way. What could a German bank possibly have to do with an American president? Well, what could a Russian government? 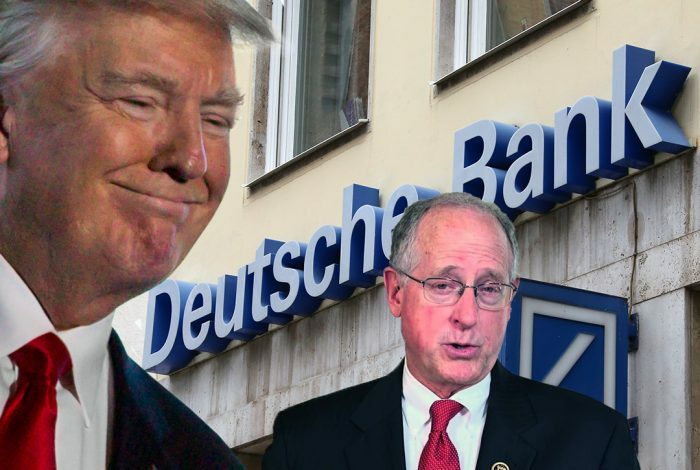 To assist Conaway in seeing “the nexus,” we offer him here our investigative series on Deutsche Bank. Related front page panorama photo credit: Adapted by WhoWhatWhy from sign (Elliott Brown / Flickr – CC BY-SA 2.0) and Rep. Conaway (US House).